All images by Andrew Abbott unless otherwise noted. So this week we didn’t really settle on what we were doing until right after a lengthy phone conversation at around eight that morning. Che mentioned this place he had been to a few days earlier and had noticed a few interesting things on the menu. It sounded good so I was game. For those not in the know this past Saturday was Free Comic Book Day and I was thusly engaged with hunting down all the free comic book related swag all over town, so I met up with Che later for a late lunch/ early dinner type situation. Going back to our last Chinatown gastroventure walking through the area is always a treat cause you never know what you might see or run into. This day in particular Che and I would notice a heavy bike cop presence on the streets in China Town. Which would later come into play at the very restaurant we ate at this week. 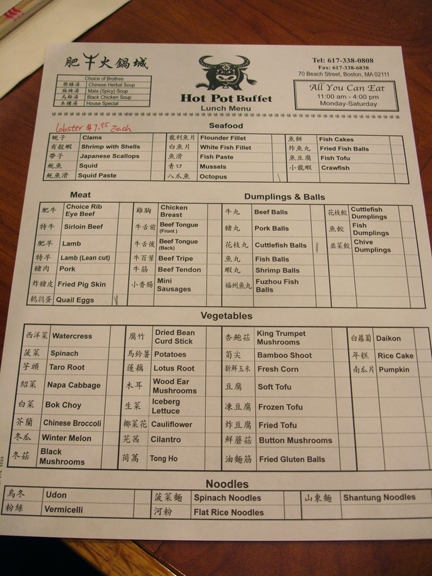 Hot Pot Buffett, previously known as the Imperial Seafood Restaurant, is in my opinion a hidden gem of China Town. With it’s unique blend of old school and modern presentation, you might not know what your getting yourself into. 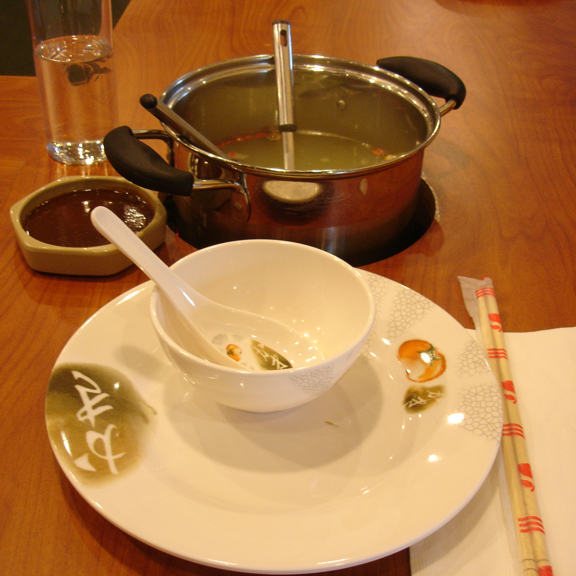 I myself had never tried the whole hot pot thing so I had no idea what was going down when we got seated in front of our own little hot plates. Che kinda gave me a walk through before one of the waitresses came and asked for our soup orders and dropped off a menu. 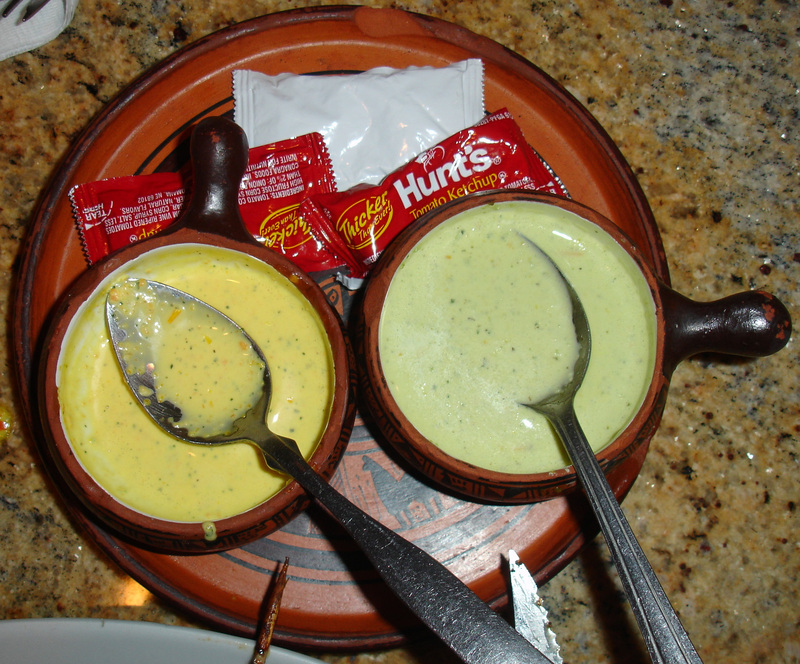 There were like five or six different soups to choose from for your base. It seemed that they were all based on the same original broth with flavor tweaks to suit your taste, but it’s really the ingredients you order that make the soup. If you’re familiar with a sushi menu where you check off which pieces and how much you want it’s remarkable similar to that, but in a way even simpler. Being a buffet you can check off however much of anything you want and they just bring it to you. The only thing that costs extra is the lobster, but hey, that’s to be expected right? Seeing that this was previously the Imperial SEAFOOD Restaurant you know the seafood is good so we ordered what we could of that off the menu and man was it good. Fresh octopus and cuttlefish were highlights for me but the best had to be the clams. We both got one and they were about the size of my fist. Before I get into the food though let me tell you how this goes down. 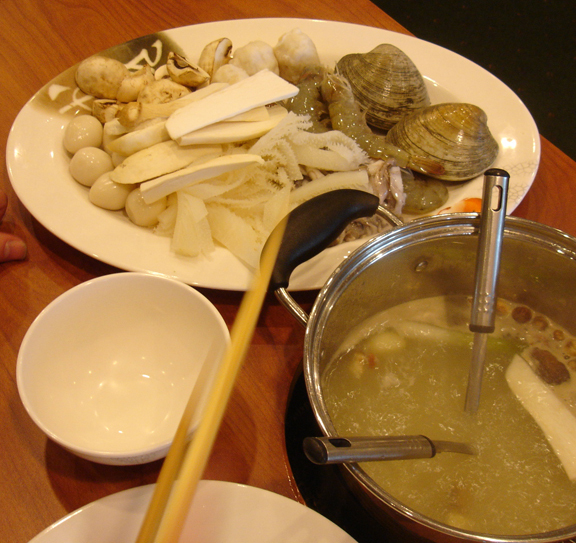 The waitress brings out a pot of whatever broth base you ordered and puts it on the hot plate to boil. You wait till it looks good and hot and drop your raw food right in and in a matter of minutes or seconds even your food is cooked in the boiling soup and ready to eat. The experience is a really similar mix of Fire/ Ice if you’re familiar with that restaurant or a classic Hibachi/ Teppanyaki style restaurant like Benihana just applied to soup. The whole doing it yourself aspect is really neat to me too. I mean sure they bring you everything you’re throwing in the pot but your doing the cooking so yeah. When else could you call your parents and tell them you made cuttle fish and quail egg soup? The last time Che was here he recalled seeing pork blood on the menu. Unfortunately this time they weren’t offering that item, but we managed to make it interesting anyway. Among the choice items we ordered were cuttlefish balls, quail eggs, pig skin, beef tongue and beef tripe, winter melon, and copious amounts of mushrooms. Including black mushrooms, wood ear mushrooms, king trumpet mushrooms, and button mushrooms. I want to know who gets to name mushrooms and how do they get this job because I want it! Don’t get me wrong though we didn’t just order the unusual stuff we also got some other might tasty options including whole shrimp and lean cut lamb. The options presented to you here are incredible and that’s why I included a copy of the menu just so you know. A few highlights of this meal like I said before was the seafood. The clams were incredible and I want to get back there and try the mussels because I didn’t notice them on the menu before looking at it just now. The cuttlefish balls were also pretty darn tasty. Like a mix of octopus and squid but much sweeter and less chewy. Winter melon was a unique surprise for me. It was much like a squash with the consistency and firmness of a potato with both a bitter and sweet taste to it. A couple things I’m on the fence about were the tripe and quail eggs. 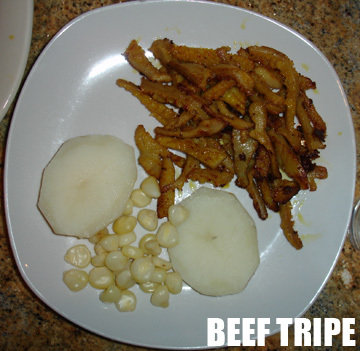 The tripe we had at Machu Picchu weeks previous was delicious and I could see myself eating it again. What I ate here, even when cooked in the delicious soup, was still too bland and chewy to be interesting and proved to be a far more formidable texture challenge presented this way. It was a lot like devouring a mouth full of rubber bands, but it didn’t put me off the meal in any way so its not a big deal. I know Che had trouble with the quail eggs. I dunno I kinda was indifferent towards them. What confused me was that they were given to you already hard boiled. When you put them in the soup they just seemed to rupture or the yolk got all goopy so when you ate them you got a hot squirt in the mouth. 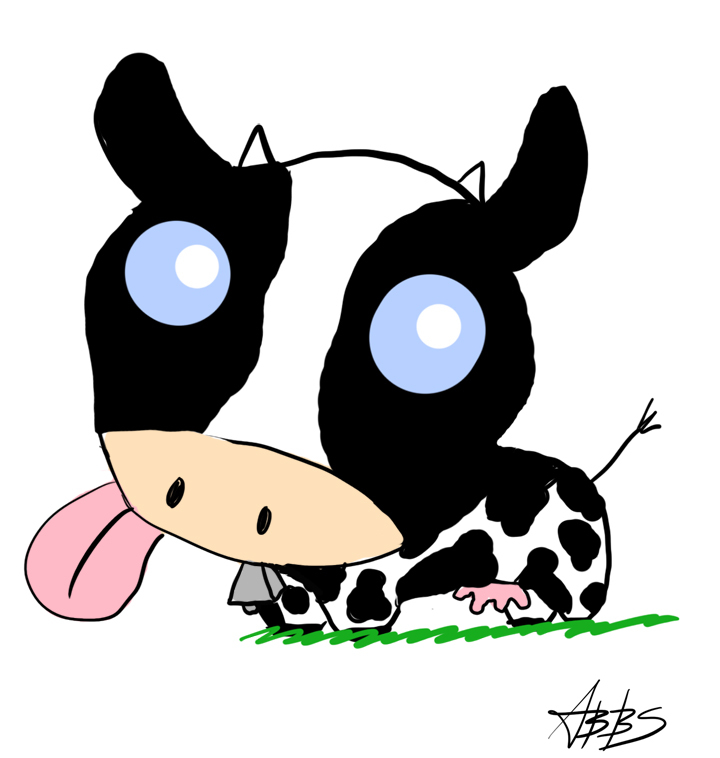 (HAHA!) All kidding aside I was mostly just confused by them. 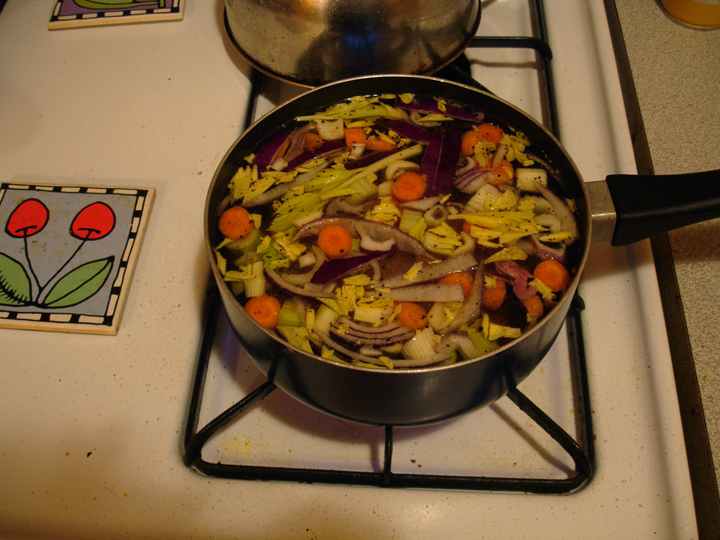 One theory I had was that they were possibly just meant to be a flavor element to the broth. When you receive your soup there’s already a whole lot of stuff floating in it. 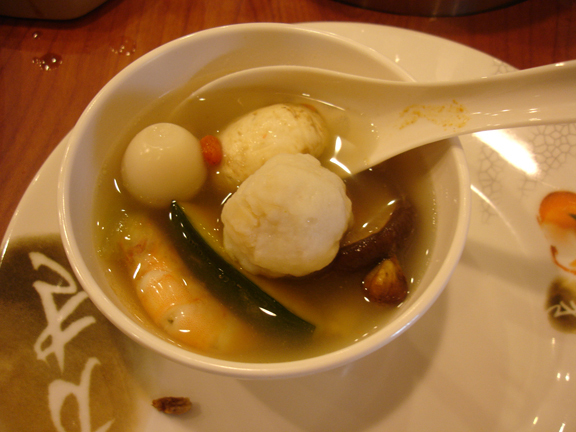 Some of which you can eat and others you probably want to avoid, but all contributing to the overall flavor and taste of the soup you ordered. I was thinking when the eggs rupture from the boiling soup maybe the yolk adds something to it, but I couldn’t be sure. I’m not a professional soup taster (yet…). The quail eggs themselves are a lot like tiny hard boiled eggs. Though when the yolk gets all goopy after being in the soup for too long the yolk tastes a lot like the yellow “mustard” you get out of crabs when your eating them. The overall flavor of the eggs was much gamier then the usual chicken egg also which is surprising for how tiny they are. Over all it was a great new experience. Everyone who worked there was extremely friendly and courteous. The atmosphere like I mentioned previously is very modern and comfortable. Che and I managed to chill there for a little over two hours just sipping on soup and chatting about which one of us was the messier eater. They weren’t that busy but I’d like to think they have their busy days because it is a really nice sized restaurant. It’s really open with plenty of seating and good light coming in. For $14.95 you get all you can eat sans the lobster but thats still a decent price including all that other seafood which is also incredibly tasty considering at other restaurants they usually charge extra for any seafood. 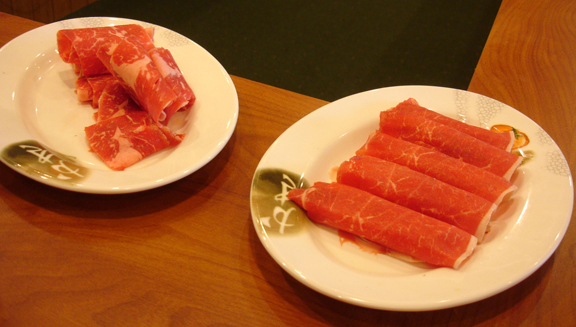 I had a great meal and would encourage anyone to give Hot Pot Buffet a try next time they’re down in China Town. On our most recent excursion, something happened that usually doesn’t anymore; the host sat down for a second and talked to us. The host had a brother, who owned a hot pot restaurant in China a lot like this one, and he told us that the reason people like this way of dining was that it was healthy. 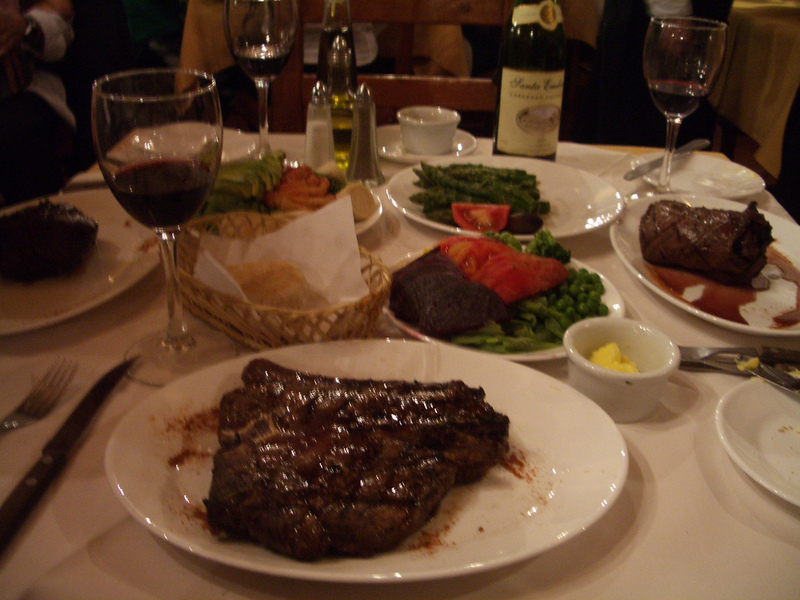 Imagine that, a way of dining that appeals not for its indulgences but for its good qualities. What would it take for this to really take hold in the United States? “First Steak in 15 Years” originally by Erika Hall. It uses the Creative Commons Attribution-Share Alike 2.0 Generic license. 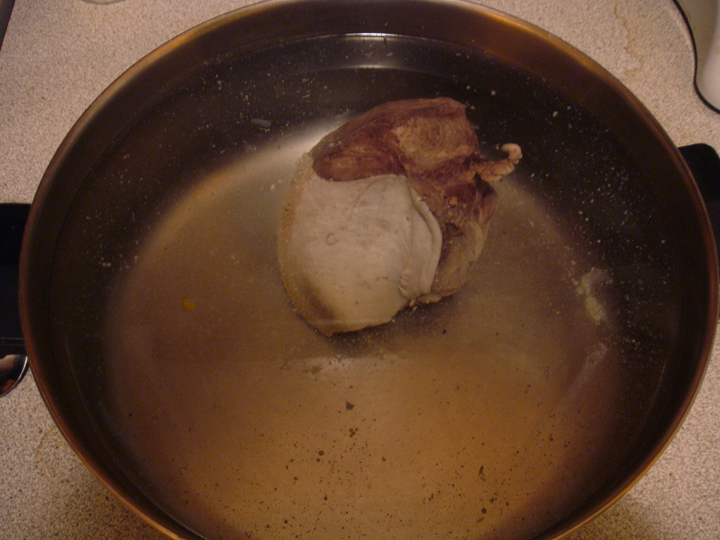 This steak has one thing going for it, its size. It’s a big slab of meat. For Americans, over-consumption has become a way of life, from the way we eat to the way we solve national tragedies. This was not always the case, but when Jimmy Carter encouraged Americans to spend less, and was booted, instead, for a president that only encouraged self-interest, it meant America had moved from an old Roosevelt idea of democracy and economy to something quite different. Instead of slowly destroying the rich, and getting rid of material wants, the rich now would run things as they saw fit. Luckily for Reagan, enough people believed that they were among the rich to make this possible. Now, in the greatest recession since the Great Depression, and with unemployment benefits giving out, this whole ideal falls apart. With it must come a return to frugality. 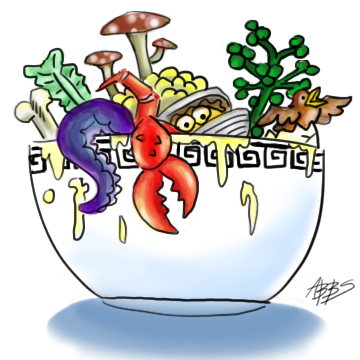 Does hot pot actually represent this? No. We still went to an all you can eat buffet, just with a different method. But like SPAM, it could be marker of a new change. What hot pot does encourage is community and responsibility. People do end up cooking together. Instead of celebrating consumption for its own sake, it encourages the healthier aspects of eating. This is what the new landscape will have to look like, at least in transition. Welcome to the new food order, but be careful. It’s hot! Something happened on this most recent trip that hasn’t happened before. I didn’t like something. As Andrew mentions in his take, the quail eggs did not go down easy. 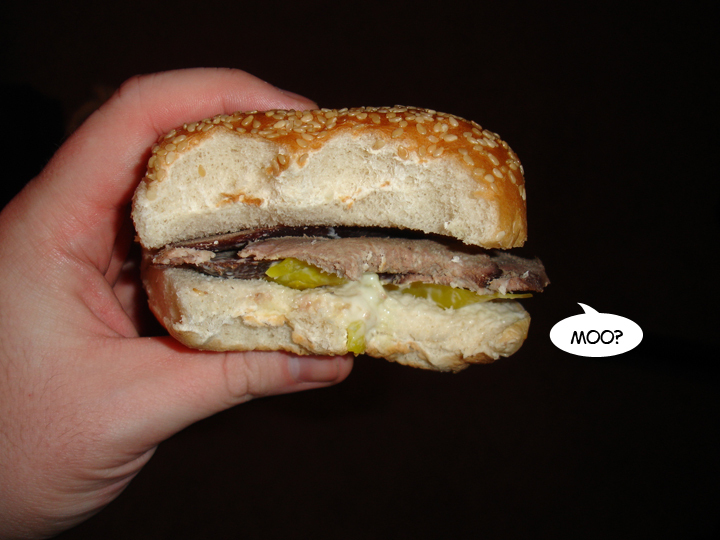 For me, it was like biting into a rubber ball filled with lamb juice. It wasn’t good. I don’t know how to feel about this. When I had that durian shake on our very first trip, it became easier with each sip. By the end, I kind of liked it. This did not happen with the quail eggs. Each one was just a return trip to awful town. Of all the foods that we’ve eaten so far, I’d have doubted that an egg would be the thing that really turns my stomach. It doesn’t really matter how open to different foods I am. There will be some things that I just don’t like. In spite of a couple of tough mouthfuls, that’s part of what makes the Gastronauts great. The excitement comes not only from liking foods that I haven’t tried before, but the knowledge that I will despise some of the foods that we come across. It’s all part of the fun. Before I get into this weeks post I’d like to take you, the reader, into the Boston Gastronaut’s very own time machine and go back to March 19th to add onto the post from couple weeks back. Seeing that I missed the week Che went to Machu Picchu for beef hearts and tripe, I met him there this past Tuesday to conduct our interview with Emily Gonzalez of Blast Magazine. The interview went well and if you’ve already read the article you can tell we had a lot of fun. The food was also pretty amazing. Needless to say it made me regret missing it the first time. 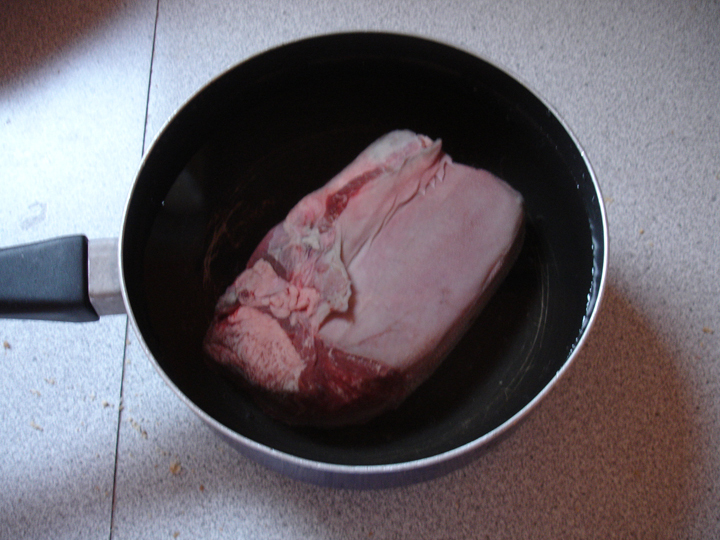 What most people don’t think about is that the meat they’re usually eating is muscle. 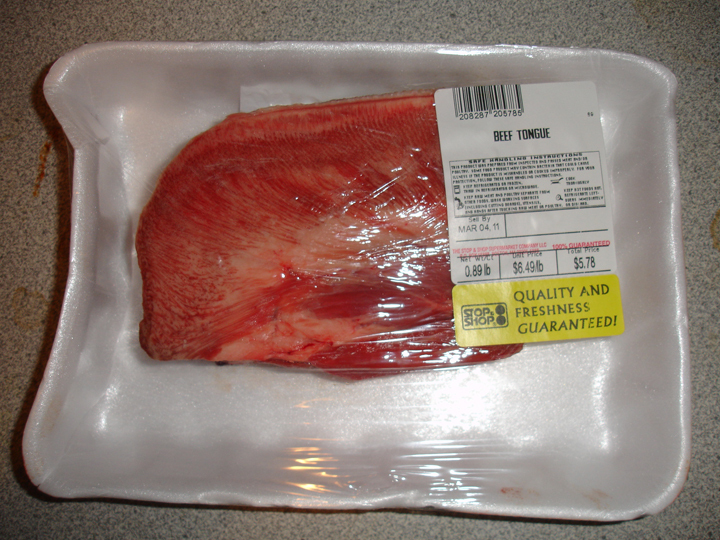 So when confronted with beef heart you should just know that you’re essentially eating the same thing. 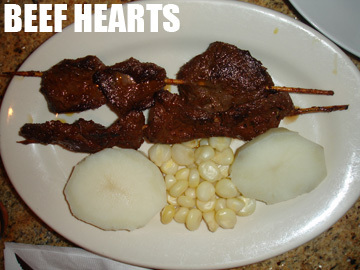 The beef heart was served on skewers and if you hadn’t been told it was beef heart in the first place you probably couldn’t tell the difference between it and any other cut of beef beyond the fact that its much more tender. The way it’s prepared and served with fresh corn and potatoes is really simple but perfect. So this week part time Gastronaut and full time roomate Mike took me to one of his favorite spots near our apartment. 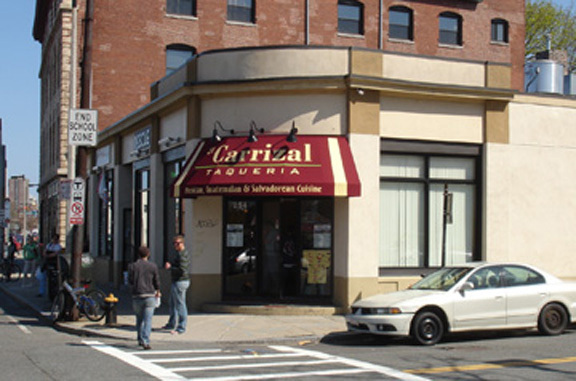 El Carrizal boasts having Mexican, Salvadoran, and Guatemalan food on the menu. It’s quite an impressive array of choices you have going in there. We got there around lunch time and the place was packed. We got one of the last tables which could seat four when Mike told me about how once when he was there on an equally crowded day they sat him down with a table already full of people eating. I was thinking we were about to end up having lunch with two complete strangers, but the crowd started to thin out and we ended up keeping our own table. Not that I would’ve had any problem eating with strangers. If anything it would’ve added to the experience. Everyone at the restaurant was really nice and the service was good. Hearing that the pupusas were tasty there I ordered some of those to start. 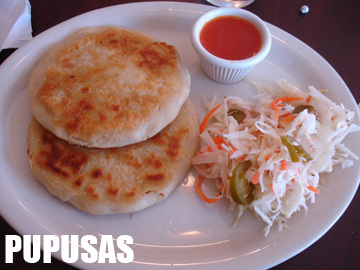 Pupusas are the Salvadorian equivalent of pita bread. They’re like thick tortillas fried and then filled with some combination of cheese, meat, beans, or veggies. What doesn’t sound good there? That’s right. Nothing! The Carrizal pupusas were filled with pork and cheese and served with jalapeno coleslaw and some zesty red sauce. Nothing to strange here just incredibly delicious. They also had pupusas served with beans and squash. I’m assuming those were the vegetarian option, and would also be quite delicious. On the menu they have what’s listed as the “Mexican Sandwich”. It comes with cheese, lettuce, tomato, mayo, and spicy habanero sauce all stacked on a nice airy loaf of white bread. You get to choose what kinda meat they stuff in there. 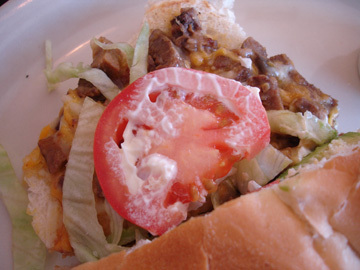 Your choices are beef (alright), chicken (okay), and lengua (whaaaaat?). 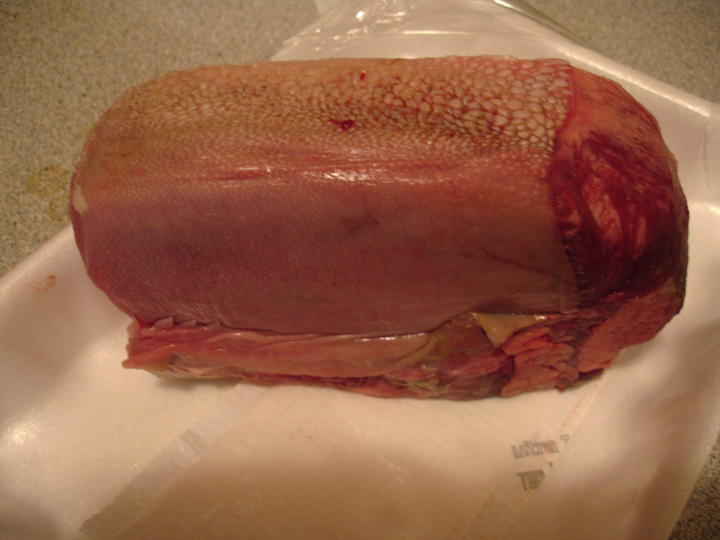 That last one’s the tongue meat. It’s chopped up and spiced up and covered in melted cheese so really it’s kind of hard to taste it with everything going on in this sandwich. 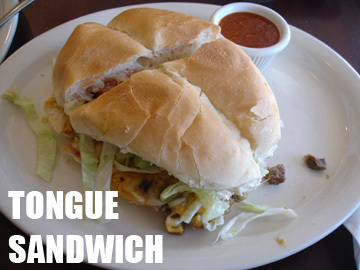 There’s a ton of lengua on the sandwich itself so every once in a while you get a big mouthful of it. Again the tongue is another muscle that people shouldn’t over think eating because it’s not much different from any other beef you’d eat. It’s apparently much more fatty then a normal cut of beef. I also felt it was much more tender, almost like stew beef. The cavemen loved to eat it back in the Paleolithic era according to Wikipedia. Not that they had that many good ideas back then, but they did manage to figure out fire. 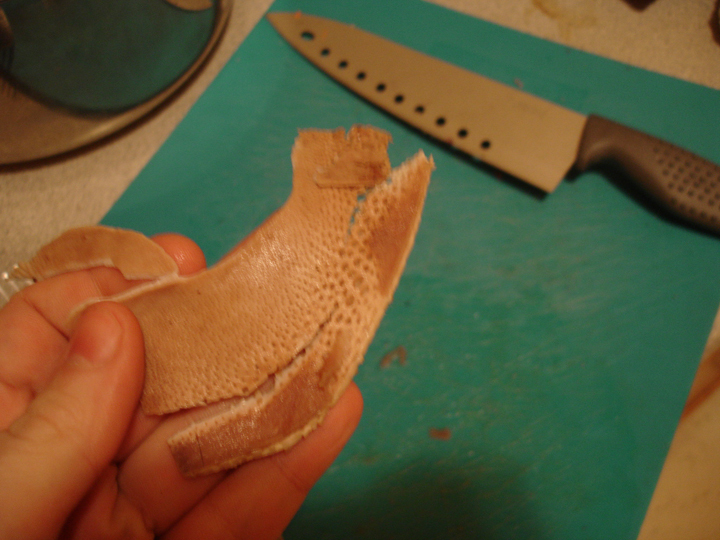 So if you feel up to it, release your inner caveman and eat some beef tongue cause its really quite delicious.